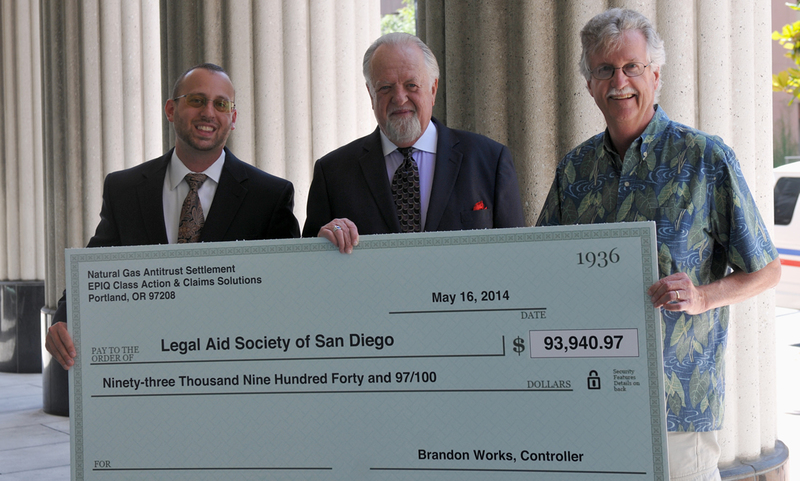 On Friday, May 16, 2014 Brad N. Baker, partner at the Law Offices of Baker, Burton & Lundy, presented a donation of $93,940 from the Anti-trust Natural Gas Settlement to the Legal Aid Society of San Diego thus completing a 14 year journey. Presented on the steps of the San Diego Superior Court at where the case was heard, this donation is the final act in the largest energy case in the history of California, which resulted in settlements and benefits of over $4 billion to California consumers and businesses. This cy pres donation was the final money left from the class action settlements administered efficiently by Epiq Class Actions & Claims Solutions of Portland, Oregon. Baker, Burton & Lundy directed the donation of the final settlement dollars to the Legal Aid Society of San Diego since the case was heard in the San Diego Superior Court by the Honorable Ronald S. Prager, who both sides thought did a magnificent job. The energy case began in 1999 when attorney Lance Astrella found evidence of a secret 1996 meeting in an Arizona hotel bedroom between high level officers from competing gas pipeline companies planning cessation of competition and the carving up of markets to take advantage of electric deregulation in California. The companies ultimately restricted the flow of natural gas into California and Nevada. Astrella brought the evidence to Baker, Burton & Lundy and together they recruited and organized a team of top attorneys and experts to investigate. In September 2000 they filed a lawsuit against El Paso, SoCalGas and SDG&E alleging market allocation and anti-trust violations only to watch the situation become catastrophic as California experienced the energy crisis of 2000 and 2001. From the legal pressure El Paso settled early for $1.7 billion and in 2006 Sempra Energy settled in the midst of trial which provided billions of dollars of benefits for California businesses and consumers in lower rates as well as a restructuring of the natural gas storage process which eliminated the opportunity for future price manipulation. Along with the prime mover, Lance Astrella, and Baker, Burton & Lundy, the high-powered consortium of attorneys included Tom Girardi of Girardi Keese, Walter Lack, Paul Traina and Rahul Ravaputi of Engstrom, Lipscomb & Lack, Pierce O’Donnell and John Shaeffer, of O & S, Brian McMahon, and Ty Kelly with Bill Bernstein and Barry Himmelstein of LCHB, heading up a second team of attorneys on the Price Indexing cases for false reporting of trades. On a personal note, presenting this donation to the Legal Aid Society has special meaning to Baker since he began his law career by volunteering at the Legal Aid Society in Venice, California. “This completes a circle” said Baker who suffered a life-threatening illness on a trip to Europe after law school and pledged that if he survived, he would donate six months of his life to a special cause. At the end of Baker’s six months of volunteering, 1,000 feet of office space became available below the Legal Aid Society. 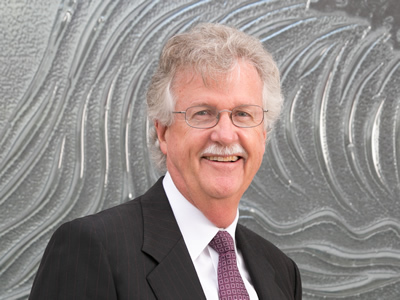 Baker approached fellow UCLA law graduate Kent Burton about forming a partnership and the law firm Baker & Burton was formed in 1976, expanding to Baker, Burton & Lundy in 1997 with the addition of trial lawyer Albro Lundy as partner. Baker indicates that he was blessed to get to work with such outstanding people in his 14 year energy case journey and knows that the blessings will continue to be paid forward by Gregory Knoll and the Legal Aid Society of San Diego.